So, Are you ready for the year 2012? Ready or not, it is coming! We do not know what the new year will hold for all of us. We could plan for it and hope that it will go that way? Do you make resolutions? I used to but gave up doing them, most of them were futile and far reaching. Wow! The time sure flies by when you are not watching! So many things have happened since my last post. I mentioned about a milestone and it is about this post. you are reading my 100th post. I am very surprised! I mean, already? Really? ...The "Upcoming" Palmetto Tatters Guild's 10th Annual Tat Days! Are you ready yet? My heart is! Mentally, I think I am ready. Physically? Well...no I am not ready! Palmetto Tatters Guild will be making a milestone in the year 2012! They... we will be celebrating our tenth ...yep, TENTH, annual Tat Days! I am already making plans for that Tat Days! My mind is spinning with ideas and plans! I love meeting all the other tatters. I love learning more with tatting. I love the location, not because it is in "MY" town But because it is beautiful there. I sat at the dining tables mostly That were located beside the picture windows. ...Special Announcement to Tatters Everywhere! One exciting thing we hope to achieve this year at Tat Days is to get in the Guinness Book of World Records! Yes! 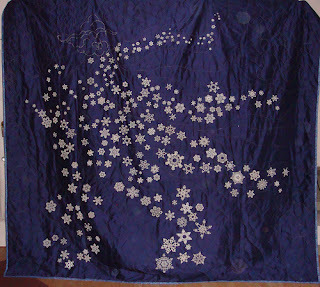 Friday afternoon, between 6 and 6:30 (EST), we will all be tatting the same pattern at the same time-making snowflakes. We will be using our Tat Off! Pattern. When searching the Guinness Records, we found 0 entries for tatting. We will be the first! And the world will know tatting is NOT a lost art! Yesterday my mailbox looked very bright after the mailman delivered some mail and a package from Cottonelle. 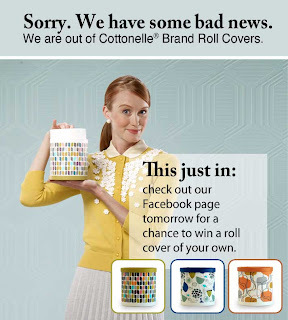 I got one of those cover for the "nekkid" toilet paper roll for free. I was going to post the site for y'all to try get your own but I saw that they ran out of that promotion. Isn't that the most wonderful Sunshine that you have ever seen... lately? This was a surprise for me and I am truly blessed by this beautiful tatted cross! Another sweet Tatter on this Earth! 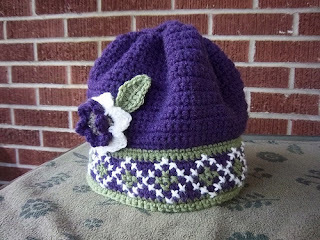 If you know a gal named Lily and has a blog called The Eye Candy for Crafters. She is the one!!!! What a sweet surprise with a lovely sweet note! I have a special offer for anyone who will be attending the Palmetto Tatters Guild's 9th Annual Tat Day on September 23-24, 2011 in Toccoa, GA. 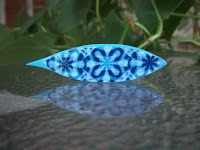 The special offer is on all of my "ONS" tatting shuttles at my Etsy shop... click here,$2.00 off each shuttles and free shipping (I'll bring them to the Tat Days for delivery!) Find the shuttle that you like, then contact me from that page, telling me that you would like to purchase that shuttle(s) and then I will set up that for you to purchase at sale price and no shipping cost. Then I'll contact you via Etsy. Please leave me your name in the contact message, so I know who to find at the Tat Days for personal delivery! This offer is good for those who pay on Etsy. First Come, First Served. It is not too late to go to this Tat Days if you haven't decided to go yet! For all the information go here: Palmetto Tatters Tat Days 2011 but hurry..the time is getting close! I dressed up so many of them... 17 of them in fact! I try real hard to do my part in this world, dressing up the nekkids! They are fashionable in many colors! Some even make a statement! Some like to be subtle! And these are just few of the examples of the latest fashion in the world of "ONS"! All of these and other ONS can be found at my Etsy Shop! I have also been busy with tatting! I been tatting up butterflies and they are taking over! But a gal gotta pay up her dues! My dues for the tatting guild that I belong to! ...I Love Rainbows and One Arrived! I love this and all other rainbows! Yesterday a large box arrived at my door. It was a hefty weight. I already knew what the box contained before opening it. There in my box waiting for me to open was my rainbow! My Rainbow! Look! I'm in heaven! Calicoes! More calicoes! My rainbow! My Hubby is the greatest! My rainbow! FABRIC! I'm in heaven! I am going to be sewing! Yes, I am! So pretty! I will be wearing these! All the delightful colors! All mine! (Yes, I am an only child) Mine! Mine.. mine!!! Colors for all seasons! I love cotton! 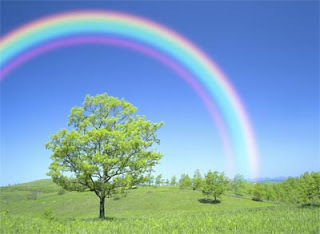 I love rainbows! I am happy to be a girl! So, what will these beautiful fabrics become? Oh, did I mention that each of these rainbows are 6 yards? ...Naturally Nora All Natural Baking Mixes! A wee while back, I entered a giveaway for Naturally Nora Baking Mixes on Sugar Pop Ribbons' blogs. and thought nothing more about this until I received an email announcing that I am the lucky winner! I once again thought nothing more ...until the PostMan ...or was it The UPS Guy? that had arrived up my driveway with a fairly large parcel addressed to me. I think that my mind has taken a vacation without my permission! I read the return label and was clueless of the sender... until I opened the said parcel! For those who know me, will eventually realize that I am not a Southern originally. My Hubby evens calls me Yankee, affectionately. Funny thing is I do not consider myself a Yankee. It is true that I was born in New York, please note that I did not mention city. My Hubby is a native Georgian born gentleman. Well, ever since moving to Georgia from Washington (I didn't say D.C.) seven years ago, there is a quote or phrase I hear often and I mean often. "It's the Southern thing". I have learn many differences of the Southern thing and it depends on who you talk to! I ate enough Brunswick Stew to notice that there are different styles and this depends on "where" in the South! Among the locals and Southerners, they even debate about whose stew is the best or better. So, it is the Southern thing.